1. We recently had some of our neighbors over for lunch, and they brought us a beautiful bouquet of flowers from their garden. Perhaps JP from A Quiet Corner will recognize them, and be happy to see her flowers are growing well in her absence. 3. I got my ears pierced when I was 7. I had to work on my mom for a while before she would take me. I still remember it very clearly, even the little gold stud earrings I picked out. 4. When I was in my freshman year of college, I got a few extra piercings in one ear, plus a piercing in my belly button. Later, I let those grow out, as I grew up. 5. I play the lottery. I have always been a dreamer. What about you, readers? Do you play the lottery ever? Linked with Nancy, from A Rural Journal, for Random Friday. I remember having my ears pierced when I was around 9. I've never played the lottery! Wishing you and your family a nice weekend, Lisa. We have weeds growing out of the cracks in our driveway. There has been way too much rain. I had several ear piercings and a naval piercing, but have let them all close up now. Beautiful flowers from JP's garden! Lottery tickets not my thing I am a dreamer but I guess not about money yet still a dreamer. Good luck on that Lisa you could do great things with that win I am sure. The flowers are lovely! We are having algae and mildew problems from the rain, I empathize! Pretty flowers! I can see why they make you smile. Send your exrta rain my way. We could use a good soaker. I think I was 8-10 when I got my ears pierced. I also have extra ear pearcings ... 8 in all. 3 in the left ear, 5 on the right. Funny, I know. One piercing in the left ear just kept getting infected and after 3 years I gave up and let the hole close. I am a daydreamer, but not a lottery player. When the money gets really big the Hubby will buy a few tickets. Never played the lottery, but I still have my original piercings from age 8! once in blue moon for the lotto tickets, an uncle once won 6 figures, my mom's cousin a million, you'd think I be encouraged, lol. I had my ears pierced when I was 15, came home and my Dad fainted, true story! (only child over protective man). Once thought of the BB but was too chicken...beautiful bouquet of mixed flowers. It's funny that you would ask - because lately i have been thinking i should learn about buying a lottery ticket. Haven't tried, yet. Love the flowers, and such a nice gift. I think you should have kept the belly button piercing. How fun! No rain here in Oregon. Weird. it has been years since i've played the lottery. years. I used to play the lottery in Texas when it first began, but then I thought "I'm spending my children's food money on this..." and I stopped. Never bought another one, even though my kids are grown now. It's addicting...and I never won anything. We never do the Lottery, but my mom always did and had big dreams of winning. I don't have any piercings anywhere because I get hurt so much unintentionally, that's enough for me! Plus, my hair always covers my ears, else I might have done my ears. We have green algae on our front stoop, have for over 25 years. If you find a good way to get rid of it, let us know! It never gets any sun there. Your flowers are beautiful! I see cone flowers, daisies, and hydrangea? I was in college when I got my ears pierced. lol! I rarely play the lottery but it's fun when I do! 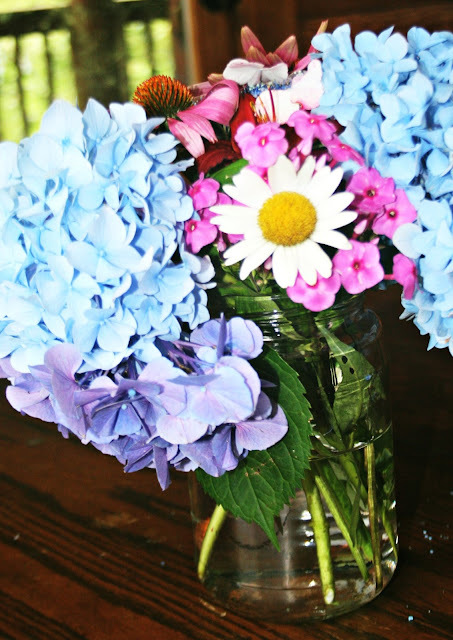 The bouquet is lovely -- the hydrangeas gorgeous. I used to play the lottery. As *they* say ... if you don't play you can't win! I'll take your rain -- we need more. I was in college when I got my ears pierced and I did them myself! Ouch! Love the flowers. We play the lottery each week. You can't win if you don't play! Enjoy your weekend. Nice bouquet! I do not play lottery. But I do remember in Jr. High hiding in the girls bathroom with a friend and letting her pierce my ears. Those flowers are so pretty! What a lovely bouquet. My husband buys a couple lottery tickets whenever he remembers to do so. He bought some yesterday actually! I'm not a gambler. Hubby won $1,000. with a scratch ticket years ago. We decided to quit while we were ahead, so have not been playing since. the flowers are very beautiful! My moms sometimes buy a ticket- but they never win anything! I have some alge growing on my back porch and the garden is so full of weeds that I can't keep up. Oh well... tomorrows another day and it is suppose to rain all night tonight. I love flowers from the garden! I just gave a bouquet to a co-worker who was leaving. I think it's like giving a piece of your heart. We play the lottery when it's a big pot. I like to dream too. When we first moved to Virginia I played the lottery. It was new to me (they don't have it in Alabama) but now the thrill of 'never winning' has taken over and I just don't do it. I do play once in awhile. I always THINK of playing the lottery! Does that count? I am also a dreamer. Hi Lisa, Your hydrangeas are gorgeous.... Nice arrangement. I never play the lottery. Never got my ears pierced either. Must be some attitudes I got from my Mennonite ancestors! I've never played the lottery. I got a couple scratch tickets from a family friend, but that's been it. If you never play, you won't win. YOur chance are better than mine.